The reason I decided to start this website in the first place was to share with the world what I was already doing: studying the American Revolution. Now I ask you...help me learn! Tell me who John Wentworth Jr is. OK, I know it's my job to tell you who the Founders are, but John Wentworth Jr has been really hard for me to find information on. However, since this is a daily blog, I thought maybe it would be a good idea to let you know what I have found, and what has been frustrating me. Consider it a 'behind the scenes' article. John Wentworth, Jr is a difficult subject to write about because of how little information I was able to find about him. Despite thorough research, I was only able to access a general overview of the man's life. In a way, he is the Anti-Founder of the Day. Most of the barely-known Founders I have discussed in the past have at least a tiny story I can discuss, even if it's just a conversation in a letter. This is particularly strange for two reasons. The Wentworth's were one of the earliest families living in New Hampshire. They had a large number of public figures, including several Governors, within their family. Heck, John's dad (John Sr) was even on the State Supreme Court during the American Revolution. The second reason Wentworth Jr.'s lack of information is peculiar is the same reason I was researching him in the first place. He came to my attention because his name is in a very high profile place. He signed the Articles of Confederation. Since I hope to cover all of the signers of the major documents, I really wanted to learn about this man. Here is what I was able to discover regarding John Wentworth Jr.
John was about 30 years old when he became a Revolutionary. He held minor positions in the Committee of Correspondence and, later, the State Assembly. While his father was a leader in New Hampshire, John Jr. seems to have been more of a foot soldier (politically speaking, as I found no evidence of his service in the field). Wentworth's election to the Continental Congress, like most men there, was to follow the wishes of his State. He just happened to have been present when those wishes were to approve the proposed confederated government. His signature on the articles was more of a 'right time, right place’ situation than anything of his own doing. Why Even Write This Article? I was concerned about publishing this article because I understand most of my readers view me as an expert and discussing something I don't know could hurt my credibility. The truth is, I decided to share something I'm unfamiliar with because I want to earn your trust. I'd prefer to be honest about something I don't know than pretend I've got it all figured out. I've dedicated years of my life to learning about lesser known Founders, and there are simply too many for anyone to know everything about all of them. One of the primary reasons I started this website was to share my passion for the Founding Fathers with people. I try to learn a little bit every day, and these articles are a way for people to come along for the ride. I think that letting you know that I found a road block was important, not just to show that history is hard sometimes (which it is), but also because if you, dear reader, are going to come on this adventure with me, well, you should enjoy the highs and the lows. Today was a low. I hope you enjoyed it. PS - I promise, if and when I find out more to Wentworth story I will publish an update. I hope you enjoyed this Anti-Founder article. If you know anything about John Wentworth Jr please let me know! I've been pulling my hair out trying to learn about him and now my curiosity is maxed out. Since there is obviously no book to recommend regarding John Wentworth, Jr. 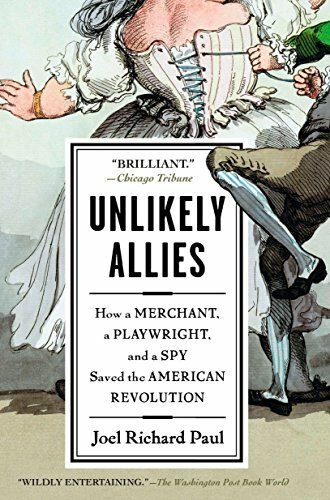 I will suggest 'Unlikely Allies'by Joel Richard Paul. It is about Silas Deane's time as the first Minister to France before the United States even declared independence. It is absolutely one of the most fun, strange, unbelievable books regarding the American Revolution even written. Look for my (thorough) article on Deane on Monday. This book will not relate a lot of Founders but it is absolutely one of my favorites so I will take this chance to tell you to go read it. As always, if you buy through the link below, you buy through our affiliate Amazon.